Consumer reviews of The North Face Trailhead 8 Tent give this 8 person, family camping palace top ratings. Learn why you should own this luxurious, three-season shelter. Dome family camping tents are designed for a home-away-from-home experience in the woods. While other manufacturers make models worthy of envy, The North Face Trailhead 8 Tent takes luxury to an entirely new level. NF likes to brag that this dome shelter is larger than some Manhattan studios and at 132 square feet, it very well might be (that said, you don't share a studio apartment with 7 other people). While most family tents for camping have 2 rooms, the Trailhead 8 has 3 rooms. Yes, a 3 room tent. Plus, two roll-down dividers allow for ultimate privacy in separated sleeping quarters. Finally, with the innovative technology that The North Face is known for, your family will stay dry during inclement weather and you can easily pitch it with your spouse, allowing the kids time to goof off after a long car ride. When it comes to family camping tents, anyone serious about sleeping in the woods should heavily consider this dome shelter. While designed for 8 people, the Trailhead 8 is an excellent 4-5 person camping tent. It's hard to give enough positive reviews and excellent ratings of The North Face Trailhead 8 Tent. Frankly, Camping Tent Reviews.com considers it one of the best family camping tents. However, one thing worth mentioning is that no site lists the number of windows that this shelter has. With 8 people, cross ventilation is essential and knowing the number and size of windows is a statistic consumers must know when purchasing family camping tents. If investing so much money in a family tent for camping, it behooves you to also purchase the Trailhead 8 footprint. Otherwise, you may limit your tent's lifespan. The best feature of these family camping tents is space and design for privacy. 132 square feet is a lot! This is your palace in the woods. With three rooms, you and your spouse can share a beer while the kids sleep or giggle in the next room. Next, the vestibule space: if it rains, no fear. 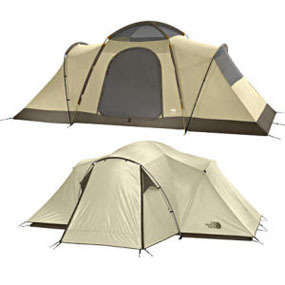 The Trailhead 8 bx family camping tent has two enormous vestibules for hiking gear and equipment. That way, if you do have a full tent of wet people, you still have room to move around without bumping into gear and each other. Need more space? Buy the gear loft. Finally, being able to easily set this dome/cabin family camping tent up after a long car ride makes it a no brainer: you must consider purchasing this tent for your family. The only disadvantage of these family camping tents is weight. This is one heavy shelter. If you will be camping near your car, then this is not a concern. However, this is not a backpacking tent. You don't want to carry the Trailhead 8 more than a few feet or you'll throw out your back. 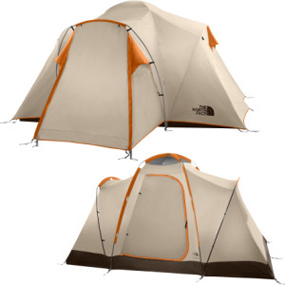 The North Face Trailhead 8 tent is one of the best family camping tents. You cannot go wrong by investing in this shelter. Even if you find the North Face Trialhead 8 best price, it is still expensive. That said, you are investing in your family's future camping enjoyment--it's an investment that will pay off for years to come. Have you been using the North Face tents? Share your North Face tent reviews and let us know how it worked for you!